I have my eighth-grade honors physical science classes do traditional science fair projects (trifold board display with research essay and lab report). This year there has been some discussion within our department about giving students alternatives. The students would be able to choose what type of project they want to do (so those who are interested could still pick a traditional project), but we’d like to explore other options. 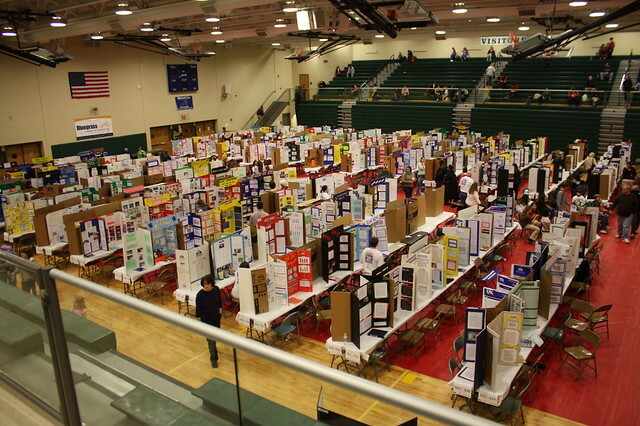 When students hear the term “science fair,” their reactions may range from cheers of excitement to groans of despair. Science fairs take a lot of time, effort, and resources. So regardless of format, it’s important to determine which science standards or learning goals will be met by having students participate. In my experience, middle school students are naturally enthusiastic, especially if they have choices of activities. But their enthusiasm can get sidetracked if they have too many options. For some students, traditional projects that involve independent research can be a motivating experience leading to career decisions and scholarship opportunities. They can also be frustrating—especially for younger students—if they do not have much experience with designing and conducting authentic investigations (other than following directions for a “cookbook” activity). I’ve seen science fairs in upper elementary and middle schools in which all participants were required to use the same template that supposedly followed “the” scientific method. The rubrics often had little room for independent thinking, and I wonder how much students learned about inquiry processes from these projects. For alternatives, check out the resources of the National History Day (NHD) competition This competition has several categories reflecting the authentic work of historians: documentary, exhibit, paper, performance, or website. Each category is described in detail in the rulebook, with directions and rubrics, and could be modified for science projects (e.g., substituting experimental research or descriptive study for the documentary category). If you ever attend a NHD showcase, you won’t find any pretzel-stick log cabins! Another alternative might be to take advantage of the many “competitions” involving students (or teams of students) in real-world projects related to research, design, and problem solving. Some examples include Toshiba/NSTA Exploravision, Invention Convention, Odyssey of the Mind, Science Olympiad, Kids’ Inquiry Conference, Siemens We Can Change the World Challenge, eCyberMission, and special event projects such as It’s Elemental. Many colleagues have shared excellent ideas for traditional and alternative science projects in NSTA journals, such as the December 2007 issue of Science and Children and the March 2004 issue of Science Scope. These articles are also good resources for secondary teachers, especially if your students are science fair novices or if you want some fresh ideas. The articles have timelines, rubrics describing high quality projects, and suggestions for helping students who may have few resources at home. They also describe online science fairs, science expos, multimedia presentations, themed projects, mini-conferences, and other nontraditional “fairs.” To save time, I’ve assembled a shared collection of NSTA resources on Science Fairs and Alternatives in the NSTA Learning Center. SciLinks also has a list of websites with many ideas for both traditional and nontraditional projects. For example, Science Buddies has a “topic selection wizard” that guides students through the process of selecting and fine tuning a topic. This site has sections and resources for both students and teachers. Keep in mind nontraditional projects or competitions can require as much work on your part as a traditional fair (and perhaps more, if you need several types of guidelines and rubrics). As with traditional projects, you’ll need to consider how much work will be completed outside of class. Do your students have resources at home? How much parental “support” will be acceptable? Will all students be required to do a project (and at the same time)? Will you allow students to work together? Will you have a public event to display the projects? Will students compete with each other? It’s exciting and rewarding to see students’ creativity, especially when they can relate science to personal interests. One of my seventh graders was very interested in writing, and for her project she created a collection of poems related to forest ecology. She entered one in a local writing project and won a medal for it. The English teacher and I were very proud of her accomplishment. This entry was posted in Ask a Mentor and tagged ExploraVision, science fair, Siemens We Can Change the World Challenge, student competition. Bookmark the permalink. Trackbacks are closed, but you can post a comment. Being a mother of 4, I understand the pains. In fact, I hate the science projects just as much as they do. These organizations are great though, I’ll be checking them out soon! There is a 3-stage creation process: stray quarks of dark matter, Light and Mass. Transpose Einstein: E over C squared = M. Connected to this: there are spirals of less gravity than the norm on the face of the earth. The two I am most sure of are at Giza and in Florida. The Giza spiral caused the area to become a plateau, and the one over here drew up the keys to make islands. The reason why they aren’t perfectly on the pattern of a golden-mean spiral is due to local tides and currents having some influence over their placements. See, the once and future Osiris.blogspot.com . . . (1st yr algebra should begin with Ohm’s Law since it represents something real.) lJoe R.